Full photo album of setting up and astrophotos here at the Whiteoaks Photo Album. Update: Here’s Jane’s version of the same evening. It was another perfect new moon Saturday for a trip to our favorite spot in the Colorado Desert out I-10. Yes this is a very full Grand Caravan! 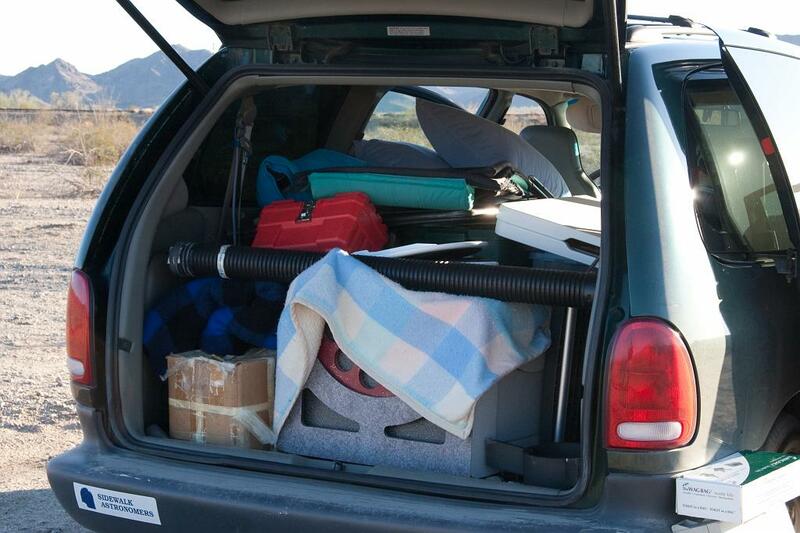 Jane and I happily took out all the seats of the old Grand Caravan and filled it with telescopes and gear. 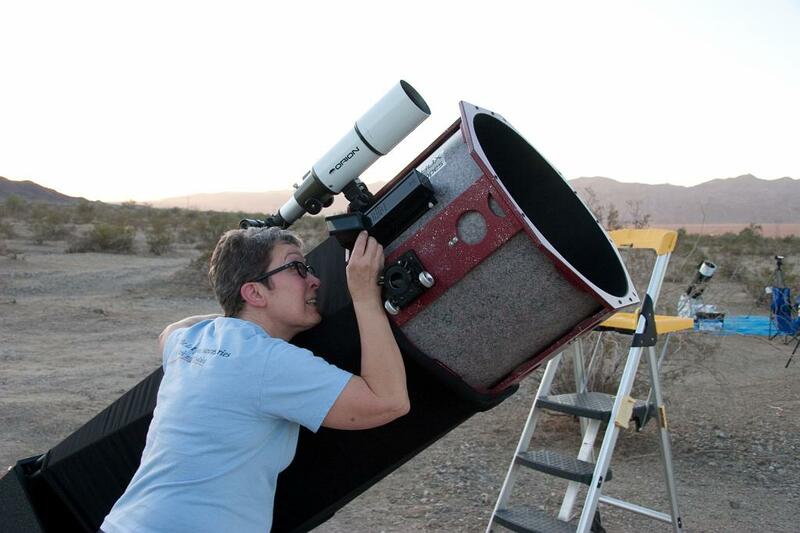 We brought her 17.5-inch Litebox dob, and our AP180EDT f/9 refractor. Jane has been indulging my dabbling in astrophotography lately. I’ve been delighted that Jane is using some of my astrophotos for the What’s Up podcast, lucky that she wants imperfect images that are closer to what one might actually see in an amateur telescope. This 180mm f/9 refractor should be an outstanding astrograph; it’s certainly an amazing visual astronomy instrument. I dabbled with it a little last year in Anza Borrego, knowing I needed to learn a lot of operating technique to get some good results. I solved a few mechanical problems then, and ran into autoguiding calibration later. Those lessons served me well, even though it’s almost a year later. Early in the evening was Jupiter time, and we all spent some time soaking up the gorgeous views through a binoviewer in steady seeing. 300x on Jupiter showed lots of detail in the bands, including a nice red barge in the North Equatorial Belt, and nice little disks and color on the moons. I’m going to take a few paragraphs to talk shop, gadgets, problems, and solutions. Setting up the AP180, all ready to take flats, except there's no known focus position! My camera is an SBIG ST-4000XCM single-shot color CCD camera which perfectly suits my recreational needs. The big AP180 is mounted on an older 900QMD mount, a simple but stable platform without GOTO electronics or servos. 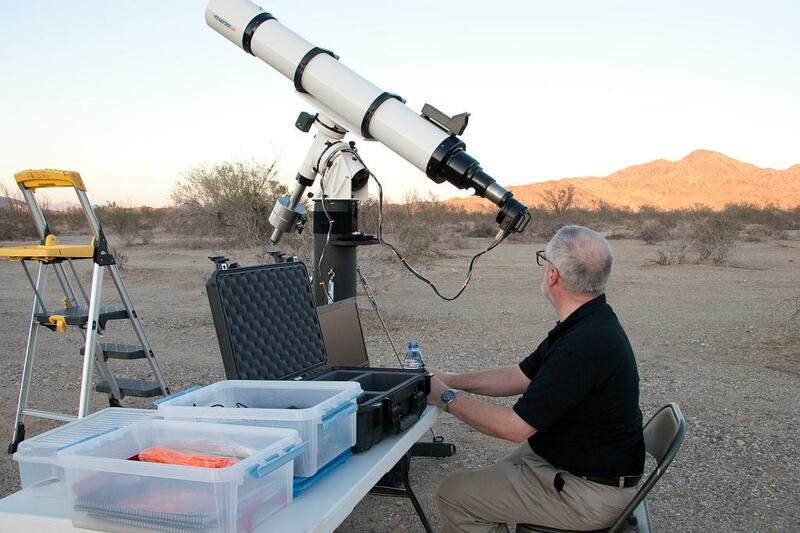 The 900QMD mount comes with digital encoders on the R.A. and Dec axes, but having spent several years using this telescope for primarily lunar and planetary observing, those encoders went unused for the life of the mount. The R.A. axis encoder is removable so you can use a polar alignment scope, and the encoder shaft has a slip fit into a metal sleeve when it’s in place. Last year I discovered that this mechanical connection slips very easily, rendering the encoder useless. The trick I settled on, which worked again tonight, was to cut a little piece of rubber band and push it into the fitting to serve as a tightener. To use the digital encoders for pointing, I acquired a BBox from JMI, connected that to a USB-Serial adapter, and used Software Bisque’s TheSky 6 to serve as my controller. I’ve learned by experience (at Fremont Peak observatory) that the alignment doesn’t need to be 100% perfect. I’ve learned the trick of syncing the software and encoders to a bright star near my target, then doing an accurate short slew to my actual target. On perusing the Software Bisque support forum last week, I was able to learn that their autoguiding calibration depends entirely on there being only one bright star in a large region of the guide imager. While I could see the guide motions working perfectly and orthogonal, the software doesn’t do matching of the star field, only looking for the one significant guide star. Having discovered that, I was finally able to successfully calibrate the autoguider. And with one successful calibration (remembering to set the current declination), I could autoguide on different targets successfully for a long time. 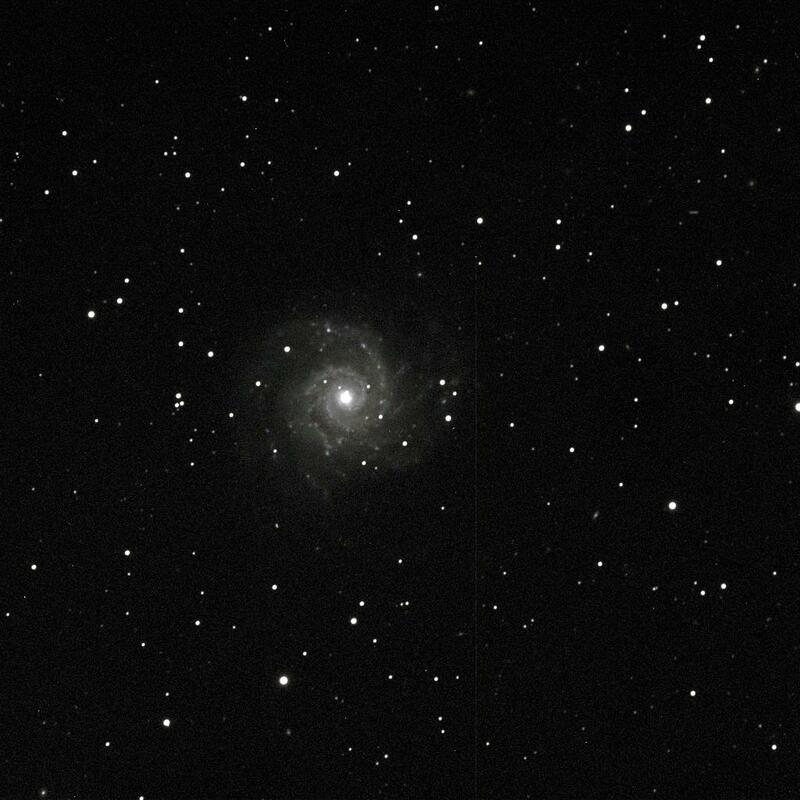 Pisces was high overhead, and I love M74, so I decided as a first target to revisit that favorite. I settled on 15-minute exposures. The first one came out “double vision” when the autoguider momentarily lost track during the exposure, but that was the only time that happened during the evening. 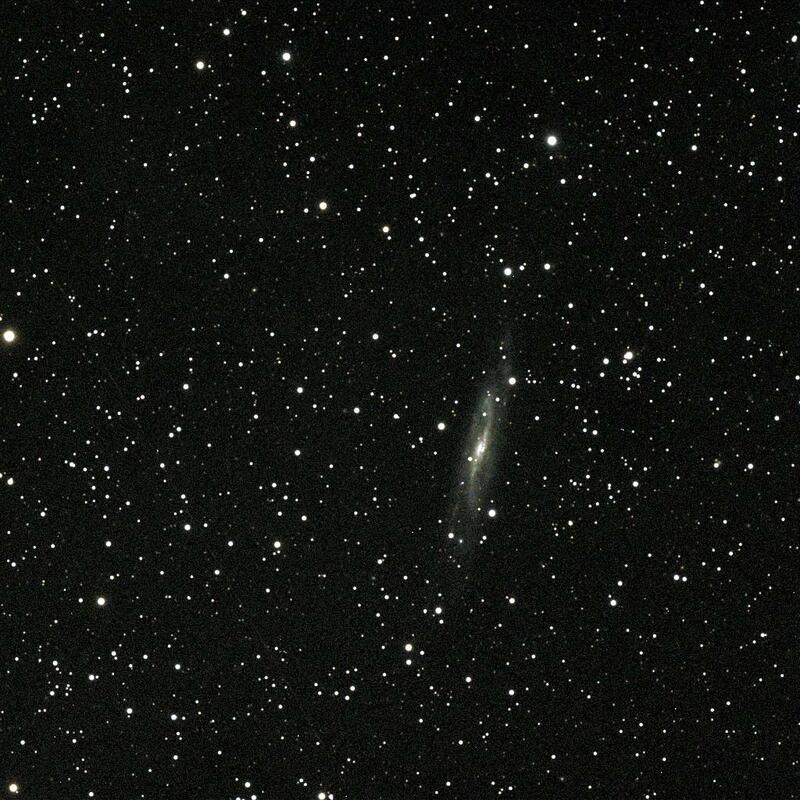 A visit to the Night Sky Observers Guide suggested NGC7541 as a Pisces “showpiece,” and I love galaxy groups. This one was gorgeous in Jane’s 17.5-inch, too. 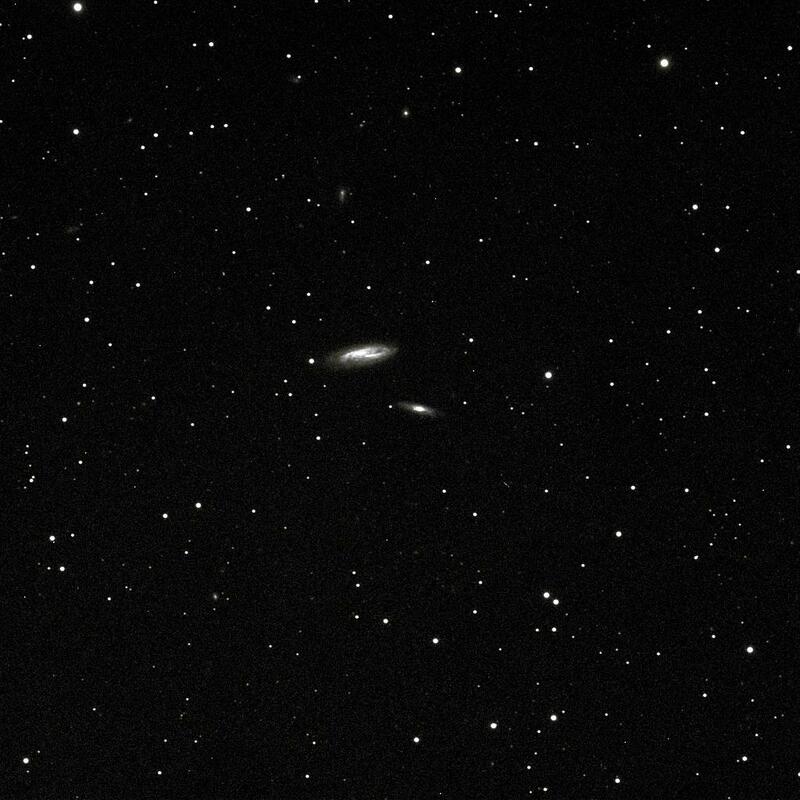 Jane showed me NGC7640 in her 17-inch, a really lovely look, and I thought it would be a great target. We’re starting to enjoy comparing visual and imaging views. I admit I get impatient when I’m imaging, and want to collect more targets rather than more exposures on the same target. As a result, I have a little more noise in my images, but I’m having fun anyway. 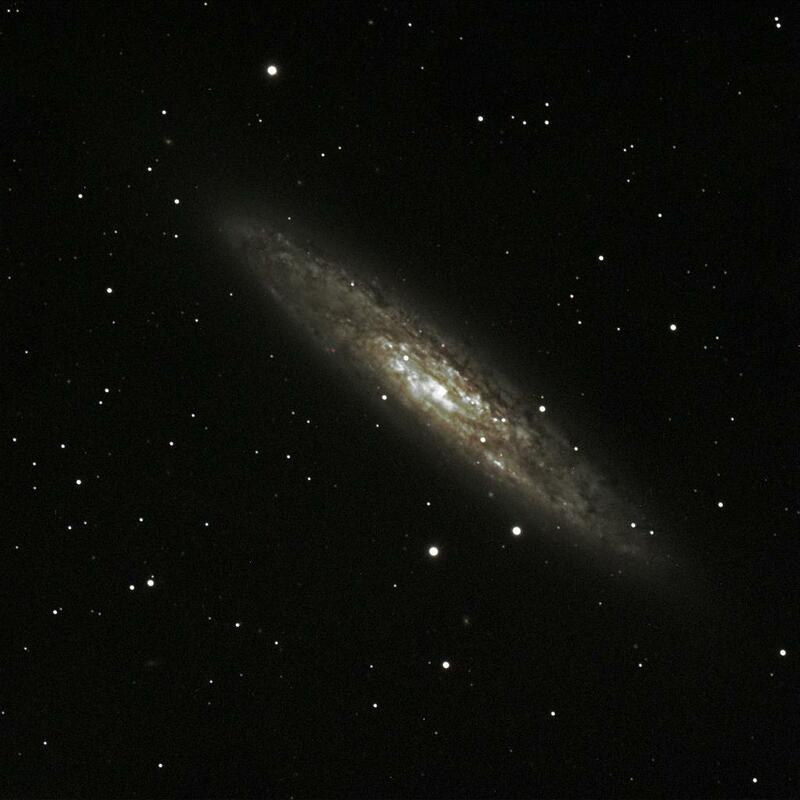 That said, I couldn’t resist spending some time on NGC253, the Silver Coin galaxy. I had a tantalizing glimpse of this target last year at Anza Borrego when I hadn’t yet learned how to make the autoguiding work. This time I got two lovely 15-minute exposures. Well worth it. After a few hours sleep, we were greeted with lovely pre-dawn crepuscular rays, Venus, and Saturn making its return after solar conjunction. Not to worry, the telescope was capped, and about to come down into its box, anyway. (You can see the box ready to be loaded with telescope.) Jane paused to take this lovely picture. 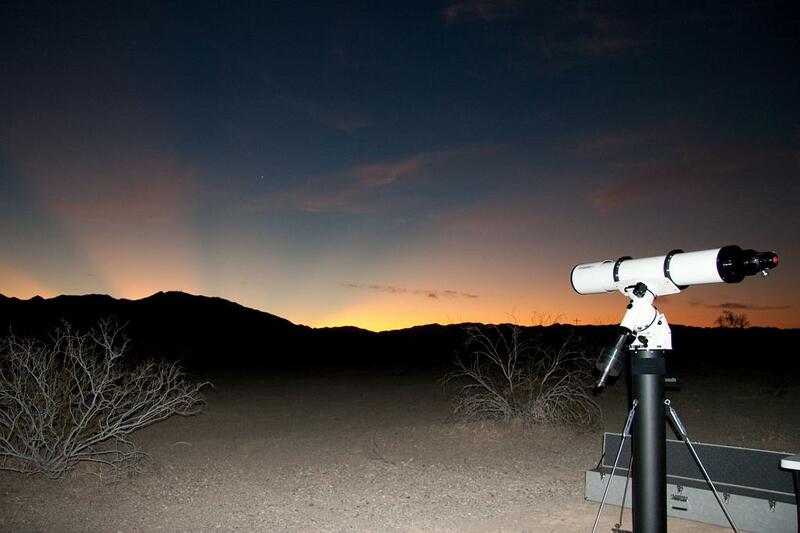 I enjoyed your astrophotography – well worth the time and view. Thanks!